Negative emotions. How we have judged them as unwanted and labeled them as horrible things that make us feel bad. Yet, how might our negative emotions actually be gifts? Why do we have negative emotions, if they’re so awful? Every “negative” emotion we have is there to alert us to the presence of a lie that we believe in and therefore filter our reality through. As we create our world through our perceptions and beliefs, we literally materialize the unmanifested universal energy into the events, circumstances, and relationships that we experience. We reflect back what we project through our subconscious filters: our own beliefs, patterns, experiences, memories, values, desires, programs, and strategies. “This being human is a guest house. Every morning is a new arrival. 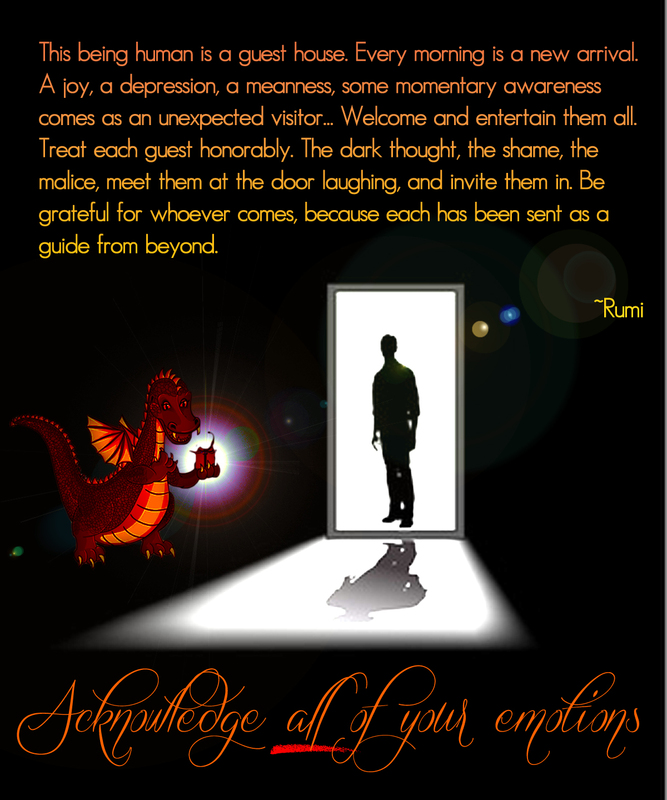 A joy, a depression, a meanness, some momentary awareness comes as an unexpected visitor… Welcome and entertain them all. Treat each guest honorably. The dark thought, the shame, the malice, meet them at the door laughing, and invite them in. Be grateful for whoever comes, because each has been sent as a guide from beyond. Every time we suppress and deny an uncomfortable feeling – what we think of as “negative emotions,” we do ourselves a huge disservice. The emotion is there to alert us to a belief that is in opposition to Truth. When we deny our darker feelings, we only resist them. To resist them is to give them more power and make them more real. However, to simply admit that we feel them is to acknowledge them, which is what allows us to walk into the darkness and find that errant belief. In finding errant belief, we can then determine how it has shaped our perception and given life to our every thought, emotion, word, deed and all subsequent manifestations that we’d like to change. Once we know what self-sabotaging belief we’ve held onto, we are free to let it go, choose another belief instead – a Truer belief – and begin to form our reality in a new way – one that is much Truer and much more to our own liking. To walk into the darkness and face our own “negative emotions” is to give ourselves a most beautiful gift: the chance to reprogram our subconscious beliefs and change the thinking of the ego-mind. We realize that we are not slaves to our emotions or our beliefs, and that we have no reason at all to fear our own “negative emotions.” Instead we realize them for the gifts they really are. Increase Psychic Perception with Ajna ORMUS – Spiritual YUM!